It should be noted that Foxy and Wolfy is an independent manga. The current chapters are available online to view HERE. A Kickstarter Campaign will currently be launching on February 14th to get physical copies made in full color with updates to the black-and-white version above! Information will be updated as soon as the Kickstarter begins on Valentine’s Day for all of you who are interested in supporting this series! WHAT IS FOXY AND WOLFY? 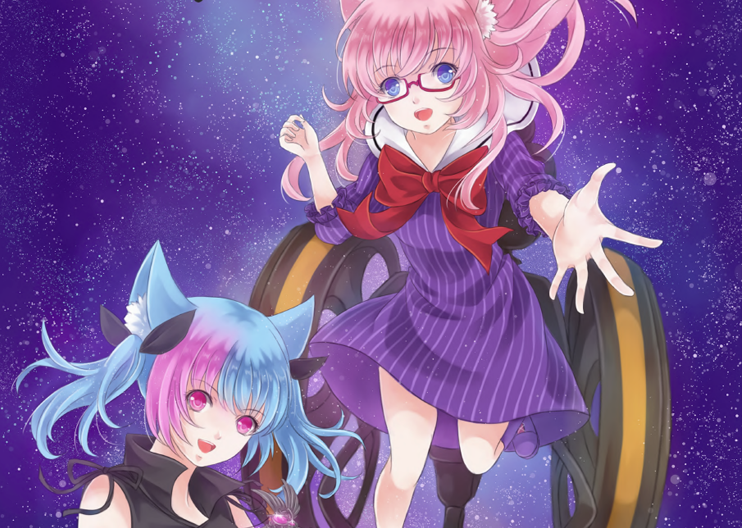 Foxy and Wolfy is a magical mix of Mahou Shoujo, good PG-13 yuri fun, and hell-raising chaos. 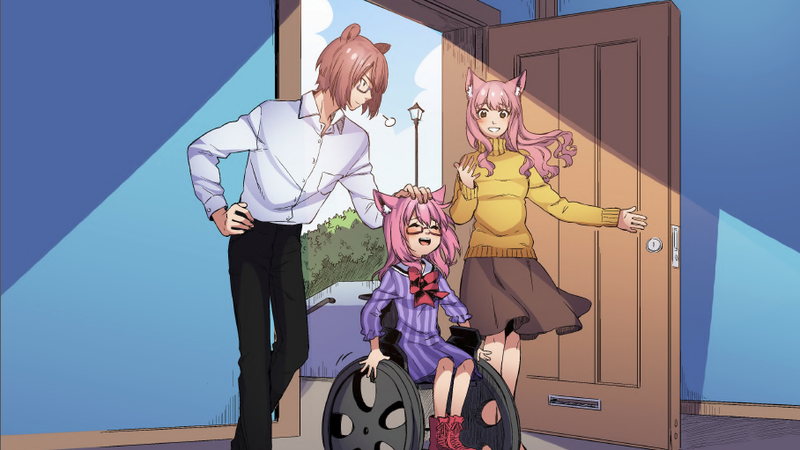 The story of Foxy and Wolfy features the adventures of two spirit guardians a Foxy young spirit guardian with muscular dystrophy named Misaki Kimura and her Wolfy partner Amaya Bellerose. In the world of FW Chaos, spirit guardians are humans who fight genocidal and bloodthirsty demons consumed by hatred. Through the use of spirit keys, the main characters Misaki and Amaya (along with their friends) travel between the human and demon worlds to defend all they hold precious against nefarious demons seeking chaos. 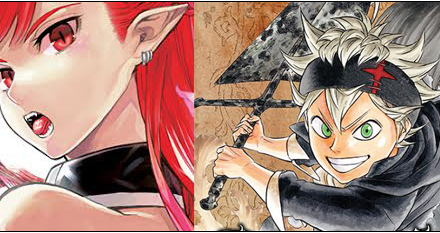 Volume 1 follows their origins and growth! Foxy and Wolfy resonates with a broad audience range. With ever evolving technology, my team and I have thankfully been able to share this wonderful story with many different people. To reach an even larger and more ambitious audience, the next step is to produce physical copies of the Foxy and Wolfy manga. Therefore, we will be launching a brand new Kickstarter campaign on February 14th this year, Valentine’s Day, in hopes of sharing the love for this web manga and transforming it into physical reality with massive updates and full color. There is just something special about physically feeling the pages in your fingers, and we want to bring that magic to Foxy and Wolfy. 01. Hello! Tell us a bit about yourself and what lead you to becoming a artist? My name is Kitsune Windsor. I have been writing casually my entire life and only in the past few years have I started taking it more seriously. 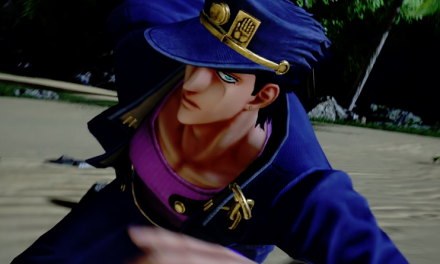 The three biggest inspirations of my writing are anime, RPG’s and the people that took me on bizarre adventures in the past! My stories are heavily influenced by 90s anime more than anything else. Especially Sailor Moon and Ranma 1/2 I find inspiration everywhere I look and visualize it as if it were a reality within an instant. The reason I got serious was to honor all of my dead friends and people that I lost, by creating something fun with pieces of them. The creators that I greatly admire are Hideo Kojima, Nobuo Uematsu, and my best teacher Onrie Kompan. These three take their visiosn and just go for it with iron skin! I wish to emulate their work ethics better. 02. What made you want to work on Foxy and Wolfy? What inspired you to create this series? I’ve always enjoyed storytelling and manga since I was very young. This is why I chose the manga style. What made me want to create stories was to escape from reality and honor all my friends and family who died. Almost every character in Foxy and Wolfy is based on a person that was dear to me, even some of the villains! 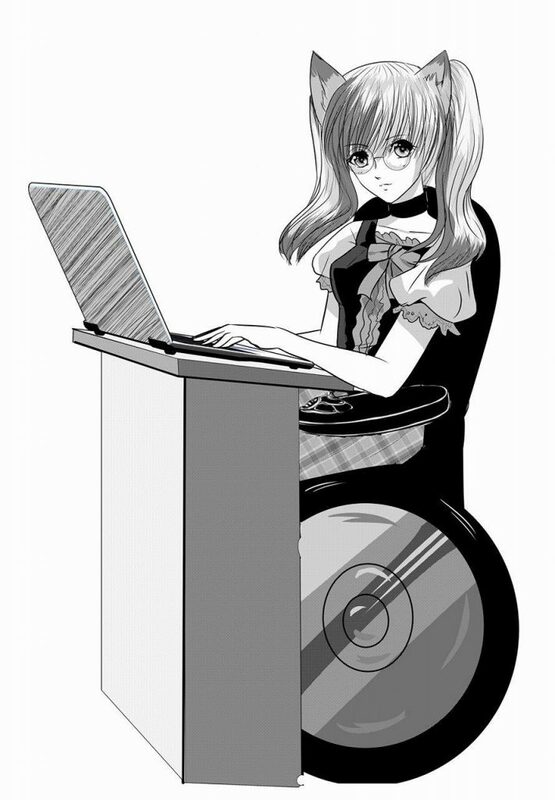 I want to also show that disabled people want and like the same things like all people. 03. That means the work is very personal and dear to you. 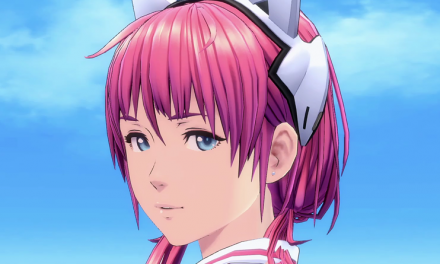 Do you feel that making this series is helping you to cope, as well as not forget all of those loved ones? Not really for coping, but more like honoring old friends and making something fun for the world. Entertaining people and making them smile is generally my intention. I think everyone will see the love that went in to every character. 04. As an artist, as a creator, what was the most difficult hurdle to overcome when making this work? 05. As far as that aspect of it, what have you learned in terms of marketing and making yourself more sellable? The most important thing I learned was to avoid being negative or sounding wishy-washy. Treat every fan as a VIP when engaging them. Don’t be afraid to put your material in peoples hands while telling them why they should want your book! 06. Did you look into other options before resting on the idea of a Kickstarter Campaign? Yes, and Kickstarter was the best choice. It allows more interaction and a feeling of being part of something special for everyone involved. 07. Can you explain what other options you looked into and why they did not work out? What interactions are you referring to on Kickstarter? I looked in to Indiegogo and gofundme, neither had that special feeling of working together to produce a new product. Kickstarter feels more like working as a team to reach the end result. To me, it’s more fun and easier to communicate on Kickstarter campaigns. The overall reach and feeling is superior to anything else I could find. 08. 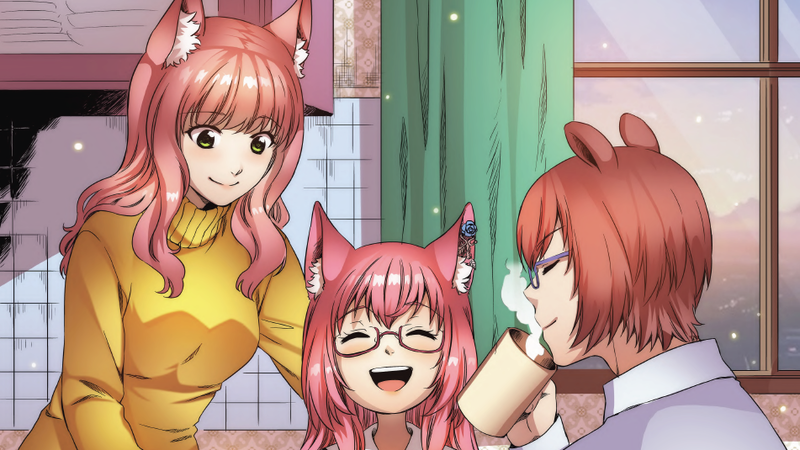 As far as Foxy and Wolfy goes, how far do you plan to expand the series upon a successful Kickstarter campaign? What are your long-term goals? I have about 1500 pages planned and side stories. I plan to sell books to fund more volumes and monthly content, just need the jumpstart. 09. Are these following volumes going to be open first to those who help to fund the Kickstarter campaign? Or will they be made available simultaneously with their public release? Every backer gets to see every page as they’re completed and months before releases. I will also be including all guest characters from the 2 previous campaigns we successfully delivered with our previous partners. 10. In the description, one of the characters has muscular dystrophy, what is the reason you chose this particular affliction? I myself happen to have Duchenne muscular dystrophy, and I know other guys and girls with MD. 11. How has this affected your life and those you know with it? How does it affect the character you have portrayed in Foxy and Wolfy? For me , it brings me joy to see someone with MD just being themselves. Many people react with inspiration about a story that shows disabled people without focusing heavily on it for sympathy. 12. You said you wanted to further promote the series with physical copies, are digital copies already available? If so, where? Currently, you can read the old version at https://www.webtoons.com/en/challenge/foxy-and-wolfyrough-draft/list?title_no=88160 and digital issues after the kickstarters will come! 13. Will all future issues that are not physical be released on your webtoons platform? In black and white, yes. would you rate its current success? It’s gradually picking up and in it’s early life still. 15. What is your main goal of the series within its entirety? If you can get funded and continue to make volumes, what is the story you hope to tell to readers who invest within your vision? A story about making the world better while showing good and evil can be also evil and good. Also to promote positive disabled and LGBT+ characters! If you want to see the latest updates about everything surrounding Foxy and Wolfy, you can be sure to follow Kitsune Windsor on any of their social media outlets.